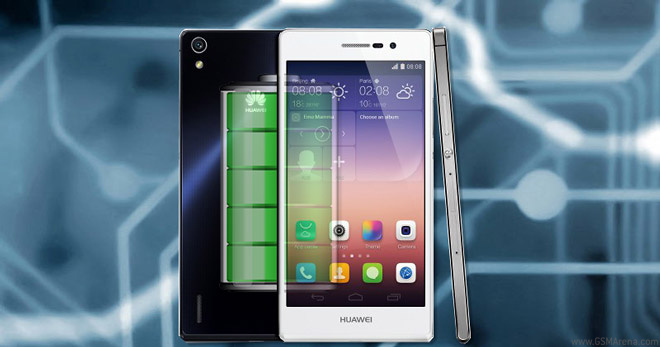 After passing our review gauntlet it’s now time to shine a light on the Huawei Ascend P7 battery life. The phone managed a decent endurance rating of 53 hours and we’re going to break down why. The Ascend P7 has to power a 5″ IPS LCD of 1080p resolution along with a quad-core 1.8 GHz processor with a 2,500 mAh battery – a slightly below average capacity compared to direct rivals of similar specs. Talk time was the single best score the Huawei Ascend P7 was able to achieve. Here the smartphone went for 13:36 hours of calling, which is respectable but far from the insane above-20-hour times posted by the likes of the HTC One (M8) (20:01h), the Samsung Galaxy S5 (21:20h) or the LG G2 (25:01h), not to mention the outrageous Sony Xperia Z1 (26:53h). 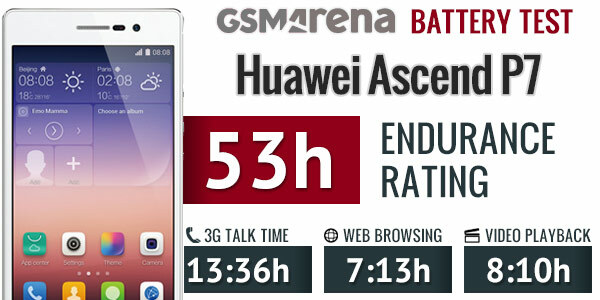 The Huawei Ascend P7 managed to surf the web for 7 hours and 13 minutes on a single charge. Again a good score but not enough to impress, putting the Ascend P7 in the company of a couple of peers like the Samsung Galaxy S4 and S4 Active or the Oppo Find 7a but far behind the HTC One (M8) (9:06h), Apple iPhone 5s (9:58h) and LG G2 (11:22h). Video playback on the Huawei Ascend P7 stood at a healthy 8:10 h – that’s a good number and will allow you to enjoy plenty of videos on the go. It doesn’t stack all that well with direct competitors like the Samsung Galaxy S5 (11:05h) or the LG G2 (11:51h). It does outperform the Sony Xperia Z1 (6:12h) or the LG Nexus 5 (6:06h), though. When we factor-in the stand by time posted by the Huawei Ascend P7 we’re faced with a decent 53 hours of endurance – the interval you’d get between charges if you do an hour of calling, browsing and video each, daily. It’s not the best we’ve seen, not even close, but that’s not to say it’s a bad performance. We’ve had our fair share of beastly battery scores as of late and that’s a mixture of over the top battery capacities and lots of software optimizations. The Huawei Ascend P7 sits in the middle – it’s not bad and it’s not the best – it’s good. If you want to learn more about the device you can check out our Huawei Ascend P7 review or if you want you can check out our Battery Tool page which will give you a list of all tested smartphones which you can sort by endurance rating, calling, browsing or video playback.